Vanilla Ice Cream or any flavour of ice cream is quite easy and straight forward to make. The one challenge is how to make ice cream without an ice cream maker. On this page, I will give details of how you can successfully make some Vanilla Ice Cream in the comfort of your home. This is just one method. I will be sharing other methods and flavours soon so stay tuned. 2 Bowls: 1 should be big enough to accommodate the ice cream mixture, the other should be big enough to accommodate the first bowl. Make a large quantity of ice cubes. This will be used in cooling down the ice cream mixture in Step 8 below. I usually make at least 30 ice cubes for this. If you will be using a vanilla pod, cut it open by slicing along it to expose the seeds. Break the eggs and separate the yolk from the egg whites. For ice cream, we need only the egg yolks. Pour the fresh milk and the whipping cream into a sizeable pot. Add the vanilla extract. If you are using a vanilla pod, add everything (seeds and fibre) to the milk and whipping cream in the pot. While waiting for that to boil, whisk the egg yolks very well. Add the sugar and mix well. Once the contents of the pot start to boil, reduce the heat to very low. If you added vanilla pods, remove the fibre from the milk at this time. Once you see that the milk is no longer foaming so much (due to the reduced heat), slowly add the egg yolks to the milk, whipping cream and vanilla mixture. Stir till well incorporated. Increase the heat to medium and stir continuously till you notice the solution thickening. This should take about 10 minutes. Once you are happy, place the ice cubes into the big bowl and add some water to them. Pour the ice cream mixture into the smaller bowl and place this bowl into the ice water bath. 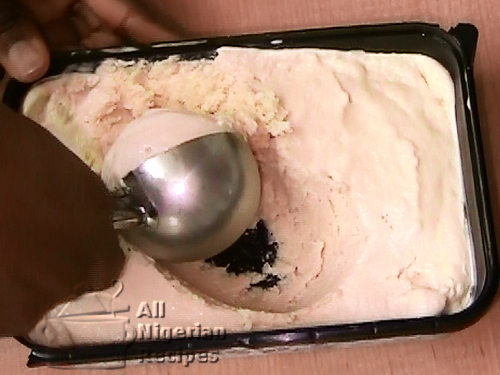 Stir the ice cream mixture continuously (with a spatula) till it cools down completely. You may need to watch the video below to see how I did this. Place the bowl containing the ice cream mixture in the freezer. After 30 minutes, bring it out, stir very well with a spatula and place it back for another half an hour. Then bring it out and stir again. Repeat the process till a creamy solid is formed. It is important to stir very often because this prevents ice from forming in the ice cream. Depending on your freezer, this process takes between 3 and 5 hours. 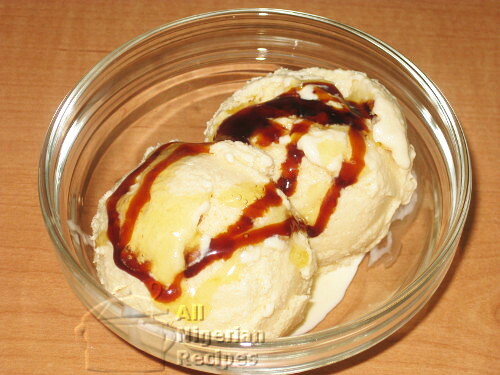 Once you are happy with the texture of the ice cream, serve and decorate with honey, caramel and/or fruits. If you have any left overs, put in a container, cover and place in your freezer till whenever. When you take it out of the freezer, it may appear rock solid unlike the ice cream purchased in the shops. All you have to do is leave it on your kitchen counter for 5 to 7 minutes or till it softens to ice cream texture before serving. If you try this vanilla ice cream recipe, send me a feedback with photos on the Facebook page.